C-Band marine-stabilised VSAT antenna systems providing broadband connectivity in all conditions with global coverage and impressive bandwidth for high-usage customers including cruise ships and offshore. 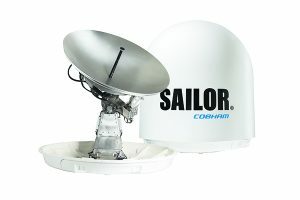 Enjoy reliable and consistent high bandwidth broadband connectivity wherever you operate with the established range of Sea Tel C-Band Marine VSAT antenna systems from Cobham SATCOM. With the unmatched throughput of maritime C-band, these high-end systems achieve unparalleled efficiency and performance for customers that demand bandwidth. Easily provide operational communication alongside passenger and crew communication, or bring your offshore operations into the world of the Digital Oilfield using IP applications for collaboration, monitoring and control. Sea Tel C-Band antennas feature an integrated control unit (ICU), eliminating the need to manually change the feed for different regions, while achieving the best pointing and accuracy of any C-Band maritime antenna available. As our most efficient ever C-band Circular only, stabilized antenna system, Sea Tel 9707D VSAT guarantees high-performance connectivity worldwide. Sea Tel 9707D VSAT’s innovative Radical Offset antenna technology provides unparalleled C-band efficiency and performance, meaning high throughput and service availability whatever the weather or the sea conditions. Regardless of where you operate, you can be sure of always-on broadband, giving you access to a wealth of communications, including business and crew centric email and web connectivity, in addition to high-end IP applications such as vessel monitoring or drilling software. An unmatched range of powerhouse features results in straightforward installation, maintenance and operation. The antenna can be accessed remotely for trouble shooting and can be configured as a dual antenna solution when using an arbitrator. Sea Tel 9707D VSAT is both INTELSAT and DSCS compliant so you get more throughput using the same or even less valuable deck space. It utilises the advanced 19″ rack mount DAC 2202 Antenna Control Unit, which offers all ports and connections needed to set up and operate complex on board communication networks. 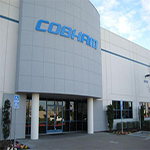 Cobham SATCOM antennas are designed and built to exacting standards. We develop and integrate innovative, cutting-edge technology to ensure high performance and reliability in the maritime arena, resulting in hardware that service providers and end-users can trust. Take for instance, Sea Tel’s 3-axis stabilization system used in Sea Tel 9707D VSAT. It isolates the antenna from the ship’s motion no matter how extreme the weather and rough the seas. The antenna system responds to ship’s movement at a rate as fast as 90 degrees per second ensuring accurate pointing and therefore a stable connection 24/7. 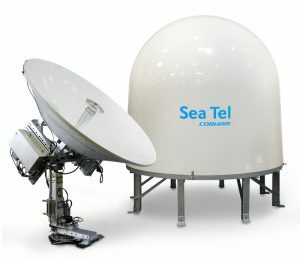 Because it is one of the most powerful and efficient C-band antennas on the market, Sea Tel 9707D VSAT is used in a variety of diverse maritime and offshore situations, all of which demand high-throughput and reliable connectivity for critical applications. Platforms, OSVs, ferries and cruise ships all use Sea Tel 9707D VSAT antennas as a way to guarantee everything from connectivity for technical applications and operational collaboration to supporting on-board retail and ensuring multiple-user connectivity for passengers and crew. Sea Tel 9797B VSAT is a high performance, dual-band selectable C and Ku-Band system that uses Radical Offset antenna technology. It offers complete flexibility and superb efficiency, with high throughput and service availability for connectivity whatever the weather or the sea conditions. 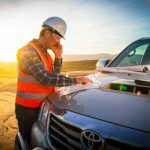 Regardless of where you operate, you can be sure of always-on broadband, giving you access to a wealth of communications, including business and crew centric email and web connectivity, in addition to high-end IP applications such as vessel monitoring or drilling software. An unmatched range of powerhouse features results in straightforward installation, maintenance and operation. The antenna can be accessed remotely for trouble shooting and can be configured as a dual antenna solution when using an arbitrator. Sea Tel 9797B VSAT is both INTELSAT and DSCS compliant so you get more throughput using the same or even less valuable deck space. It utilises the advanced 19″ rack mount DAC 2202 Antenna Control Unit, which offers all ports and connections needed to set up and operate complex on board communication networks. Cobham SATCOM antennas are designed and built to exacting standards. We develop and integrate innovative, cutting-edge technology to ensure high performance and reliability in the maritime arena, resulting in hardware that service providers and end-users can trust. Take for instance, Sea Tel’s 3-axis stabilization system used in the Sea Tel 9797B VSAT. It isolates the antenna from the ship’s motion no matter how extreme the weather and rough the seas. The antenna system responds to ship’s movement at a rate as fast as 90 degrees per second ensuring accurate pointing and therefore a stable connection 24/7. Because it is one of the most powerful and efficient C-band antennas on the market, Sea Tel 9797B VSAT is used in a variety of diverse maritime and offshore situations, all of which demand high-throughput and reliable connectivity for critical applications. Platforms, OSVs, ferries and cruise ships all use Sea Tel 9797B VSAT antennas as a way to guarantee everything from connectivity for technical applications and operational collaboration to supporting on-board retail and ensuring multiple-user connectivity for passengers and crew. Sea Tel 9797B VSAT is fully approved for Naval vessel installation and meets MIL-STD-167 specifications for shock and vibration, Navy MIL-STD-901D Grade B shock standards and MIL-STD-461 EMI & RFI standards (including 200V/M). It is also available in an X-band version. All Cobham SATCOM VSAT antennas are designed and built to exacting standards, ensuring their suitability for the harsh maritime environment. In any conditions or operational environment, you can count on the quality of design, components and manufacturing, and benefit from a reliable link at all times. It combines a C-band circular/ linear Switchable Feed as well as a Ku-band cross/copol switchable feed with sub-reflector. The combination allows switching from C-band operation to Ku-band operation electronically and eliminates the need to manually change the feed. The Ku-band sub-reflector has been designed to optimize the RF performance of the 2.4 meter antenna. 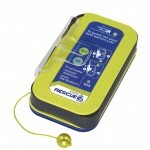 This patented state-of-the-art design is second to none when it comes to RF performance. 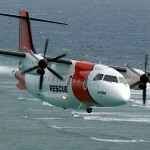 The Sea Tel 9711 IMA features a 2.4 meter radical offset antenna for both the C-band and Ku-band operation. This offset design provides the most efficient 2.4 meter antenna in the market today. 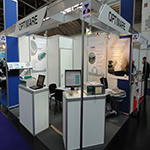 Software has been specially designed to switch from C to Ku-band operation in a matter of seconds. By eliminating the need to manually change feeds when switching between bands, the Sea Tel 9711 IMA is incredibly cost effective. A technician is no longer required to be dispatched for making configuration changes., eliminating offline time for a vessel while switching between networks. 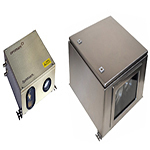 The Sea Tel 9711 IMA system is fully compatible with OpenAmip and ABS technology. By combining multiple option files in a single modem, the user can make near seamless transitions from C band circular A Pol to B Pol, C-band linear, and Ku-band satellites. The Sea Tel 9711 IMA Systems utilize the IMA architecture currently used on our XX12 series products. It features an Integrated Control Unit (ICU) that offers a single box electronic control solution to maintain the best and most efficient pointing accuracy. With its extended web based secured user interface, built-in remote management capabilities, it offers easy integration into network management systems through its Media Xchange Point (MXP). The web user interface, accessible from practically any internet enabled device, including mobile devices, features Secured Socket Layer (SSL) password protection and multi-level data analysis capability for ease of use and added security. The Sea Tel 9711 IMA systems with C/Ku switchable feeds are the cutting edge, top-of-the-line solutions for your top per formance maritime communication needs. 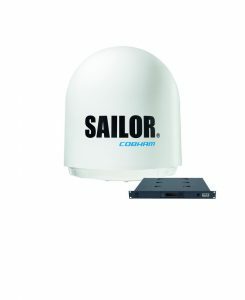 Under the SAILOR and Sea Tel brands, Cobham SATCOM offers the most diverse range of high-performance, reliable and feature-rich Ku-Band VSAT antenna systems available today. 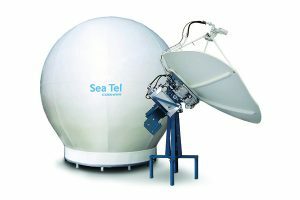 SAILOR and Sea Tel Ku-Band Marine VSAT systems feature high-performance 3-axis stabilised antennas for reliable, high bandwidth connectivity and flexible installation. They are designed to out-perform competing antennae and promise easier and quicker installation and configuration on a wider range of vessels. We offer Ku-Band systems for standardised or customised VSAT and hybrid networks that are ‘always-on’ and offer fixed monthly data costs. 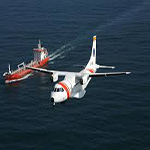 They provide reliable connectivity for operations, passengers and crew, with fast response to the ship’s motion to avoid signal loss and an intuitive web user interface accessible from any internet-enabled device. This tough technology meets some of the most gruelling shock and vibration specifications. Some RF packages can be field-upgraded from Ku-Band to Ka-Band, to work on Inmarsat’s Global Xpress network for greater flexibility and reach, while an integrated control unit provides single box electronics that maintain the best and most efficient pointing accuracy in the maritime market. SAILOR 800 VSAT is a standardized high-performance 3-axis stabilized Ku-band antenna system with an 83 cm reflector dish. The SAILOR 800 VSAT provides the same or better radio performance than a typical 1m antenna. 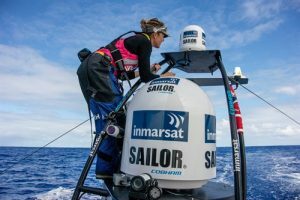 These claims are supported by industry 3rd party testing, which has shown that SAILOR 800 VSAT provides the best performance for an antenna in the 80cm class. 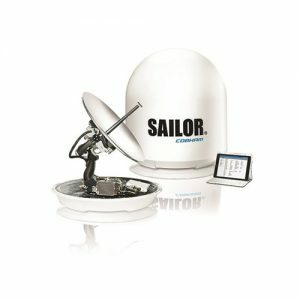 SAILOR 900 VSAT, it is quick and easy to deploy – but with a 20% smaller form factor SAILOR 800 VSAT can be used on vessels that otherwise would not consider VSAT because of the size and weight of suitable antennas. The focus of the new SAILOR 800 VSAT is on RF performance, G/T, which is >18 dB/K – a value equal to or higher than most other 1m maritime VSAT antennae performance claims – yet it’s much smaller and lighter. This performance makes the new 83cm antenna suitable for vessels that would normally specify a 1m antenna. 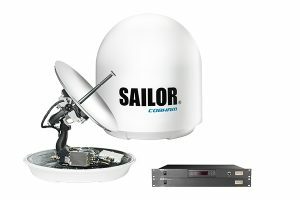 The unique, class-leading performance of SAILOR 800 VSAT also opens up a world of high quality, reliable communications for a wider number of vessels including workboats, fishing vessels, inland waterways and yachts, whilst providing installation flexibility for vessels of all types and size. Customers who would previously have specified a 1m antenna or who may have considered VSAT too ‘big’ for their vessel, can now install a SAILOR 800 VSAT and enjoy the benefits of a 20% smaller form factor with the performance of a much larger antenna. Every SAILOR 900 VSAT antenna system comes factory-tested, equipped ready-togo with standardized top quality RF components (8W BUC, LNBs, OMT/diplexer) – and only one cable between antenna and below-deck. The antenna is shipped fully balanced, configured and does not need work prior to installation. This time and cost saving, plus the top RF performance make SAILOR 900 VSAT the most cost effective Ku-band antenna on the market to deploy. Sea Tel 4009 VSAT integrates the latest innovative antenna technology to deliver high performance and flexibility. More information can be found under the ‘Features’ tab below. Sea Tel 4009 VSAT antenna is an innovative Ku-band marine stabilized antenna system incorporating the latest technology in optimal reflector performance and vertical isolation characteristics. It’s innovation positions it as one of the best RF performing Ku-band antennas available to ships and offshore vessels, so you can count on availability of passenger, crew and operational access to email, web browsing, data transfer, VPN, videoconferencing and technical IP applications. Reliability in design has been the driving force behind development of the Sea Tel 4009 VSAT antenna. It is designed and approved to withstand the most demanding sea conditions imaginable. 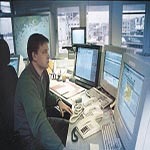 You can be confident in a stable connection when making important calls from the bridge, sending emails to family and friends or enhancing vessel and fleet efficiency using advanced online monitoring tools. Sea Tel 4009 VSAT features versatile mounting configurations for BUC and transceiver options whilst an unmatched range of powerhouse features results in straightforward installation, maintenance and operation. 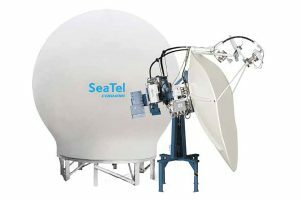 Sea Tel 4009 VSAT is compatible with a diverse range of modems, networks and service. It utilises the advanced 19″ rack mount DAC 2202 Antenna Control Unit, which offers all ports and connections needed to set up and operate complex on board communication networks. Cobham SATCOM antennas are designed and built to exacting standards. We develop and integrate innovative, cutting-edge technology to ensure high performance and reliability in the maritime arena, resulting in hardware that service providers and end-users can trust. Take for instance, Sea Tel’s 3-axis stabilization system used in Sea Tel 4009 VSAT. It isolates the antenna from the ship’s motion no matter how extreme the weather and rough the seas. The antenna system responds to ship’s movement at a rate as fast as 90 degrees per second ensuring accurate pointing and therefore a stable connection 24/7. Sea Tel 5012 VSAT is a 1.2m 3-Axis marine stabilized antenna system featuring advanced technology and IMA electronics for high performance and easy operation. Sea Tel 5012 VSAT is a fully optimised 1.2m antenna system designed to meet the demanding maritime communication needs of the 21st century. 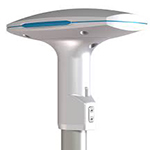 IMA electronics and innovative design combine to ensure it improves on the performance of Sea Tel’s industry leading 5009 marine stabilized antenna system, on which it is based. The state-of-the-art Sea Tel 5012 VSAT comes in a frequency tuned 1.68m (66″) radome. It features the best and most efficient pointing accuracy in the maritime market, which ensures your ability to reliably use high throughput email, web browsing, data transfer, VPN, videoconferencing and technical IP applications. Sea Tel 5012 VSAT is easy to install and designed to meet some of the toughest shock and vibration specifications, such as IEC 60721, IEC 60945 and MIL STD 167-1. It uses the same RF components as the Eutelsat type approved Sea Tel XX09 systems, to enhance its ability to operate in any conditions. With a tough testing regime, all relevant approvals in place and compatibility with many different types of modems, networks and services, Sea Tel 5012 Ku is suitable for providing highly-reliable connectivity and voice communication on a diverse range of vessels, from ships and OSVs, to oil rigs and Naval vessels. With a fully IP based ‘plug and play’ architecture Sea Tel 5012 VSAT is easy to install and operate. It has an extended web based secured user interface, built-in remote management capabilities and offers integration into network management systems through its Media Xchange Point (DAC-2202). Because Sea Tel 5012 VSAT can be controlled via the Internet from most Internet enabled devices, it also provides a strong sense of connectivity with the company’s headquarters on shore, thus amplifying VSAT’s natural aptitude for uniting and strengthening any maritime enterprise. Cobham SATCOM antennas are designed and built to exacting standards. We develop and integrate innovative, cutting-edge technology to ensure high performance and reliability in the maritime arena, resulting in hardware that service providers and end-users can trust. 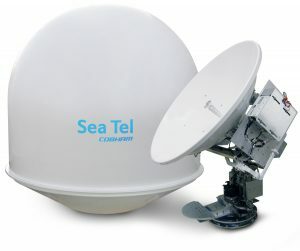 Standard features of the Sea Tel 5012 VSAT include 3-axis stabilization, which isolates the antenna from the ship’s motion no matter how extreme the weather and rough the seas, whilst the integrated control unit (ICU) offers single box integrated electronic control to maintain the best and most efficient pointing accuracy available. Sea Tel 6012 VSAT is a 1.5m 3-Axis marine stabilized antenna system featuring advanced technology and IMA electronics for high performance and easy operation. Sea Tel 6012 VSAT 1.5m antenna is or largest fully optimised antenna system designed to meet the demanding maritime communication needs of the 21st century. IMA electronics and innovative design combine to ensure it improves on the performance of Sea Tel’s industry leading XX09 marine stabilized antenna systems, on which it is based. The state-of-the-art Sea Tel 6012 VSAT comes in a frequency tuned 1.68m (66″) radome. It features the best and most efficient pointing accuracy in the maritime market, which ensures your ability to reliably use high throughput email, web browsing, data transfer of large files, VPN, videoconferencing and technical IP applications. Sea Tel 6012 VSAT is easy to install and designed to meet some of the toughest shock and vibration specifications, such as IEC 60721, IEC 60945 and MIL STD 167-1. It uses the same RF components as the Eutelsat type approved Sea Tel XX09 systems, to enhance its ability to operate in any conditions. 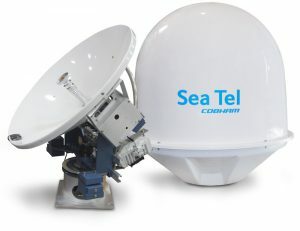 With a tough testing regime, all relevant approvals in place and compatibility with many different types of modems, networks and services, Sea Tel 6012 VSAT is suitable for providing reliable, high-throughput connectivity and voice for passenger, crew and corporate network use on a diverse range of vessels; from ships and OSVs, to oil rigs and Naval vessels. With a fully IP based ‘plug and play’ architecture Sea Tel 6012 VSAT is easy to install and operate. It has an extended web based secured user interface, built-in remote management capabilities and offers integration into network management systems through its Media Xchange Point (DAC-2202). Because Sea Tel 6012 VSAT can be controlled via the Internet from most Internet enabled devices, it also provides a strong sense of connectivity with the company’s headquarters on shore, thus amplifying VSAT’s natural aptitude for uniting and strengthening any maritime enterprise. 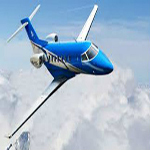 Cobham SATCOM antennas are designed and built to exacting standards. We develop and integrate innovative, cutting-edge technology to ensure high performance and reliability in the maritime arena, resulting in hardware that service providers and end-users can trust. Standard features of the Sea Tel 6012 VSAT include 3-axis stabilization, which isolates the antenna from the ship’s motion no matter how extreme the weather and rough the seas, whilst the integrated control unit (ICU) offers single box integrated electronic control to maintain the best and most efficient pointing accuracy available. Sea Tel USAT30 VSAT offers superb performance and pointing accuracy to ensure high quailty connectivity, even on the edge of the satellite footprint. 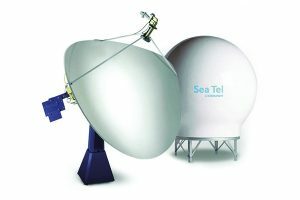 Sea Tel USAT30 VSAT is an aesthetically pleasing compact and lightweight design, so is suitable for installation on sun-drenched luxury vessels, but still rugged enough for workboats and ships. 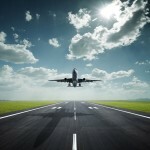 The platform is designed to become part of a vessel, regardless of what the vessel is used for. It withstands the harshest weather nature can throw at it and keeps on delivering broadband Internet and high quality voice calling without fail. 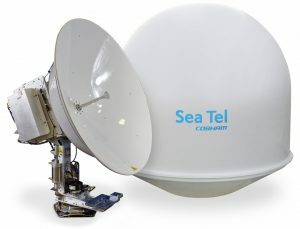 Sea Tel USAT30 VSAT is a 75 cm Ultra Small Aperture Terminal marine stabilized antenna system for broadband connectivity. It leverages leading technology concepts to reduce size whilst matching performance of some larger antennas. An innovative stabilization system isolates the antenna from the vessel’s motion no matter how extreme the weather and rough the seas. 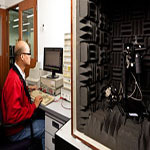 The antenna system responds to movement at a rate as fast as 90 degrees per second ensuring accurate pointing and therefore a stable connection 24/7. Though a small package, Sea Tel USAT30 VSAT is not designed for compromise. 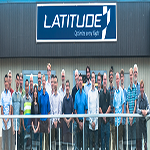 It is packed with high performance features that track satellites faster than the wind can change direction or the tides can swell and its higher carrier to noise ratio enables highly reliable communications. The technology is a result of over 10 million person hours of development, and when you consider Cobham SATCOM’s experience in designing VSAT antennas for Naval vessels, oil rigs and highly advanced offshore vessels you can be confident of Sea Tel USAT30 VSAT’s ability to perform on your super yacht, mega yacht or workboat. The compact form factor of Sea Tel USAT30 VSAT makes it suitable for any vessel where deck space is at a premium. If you need an antenna that can provide reliability and availability of service, but with a smaller footprint on board, then Seatel USAT 30 is for you. The system can be installed in hours, thanks to its ability to work with or without ship’s gyros and the advanced 19″ rack mount DAC 2202 Antenna Control Unit, which offers the same ports and connections as our larger antennas. The antenna is easy to maintain and can be accessed remotely from anywhere and anytime. The only choice for easy to deploy, high performance and reliable maritime broadband on Telenor’s THOR 7 network. The SAILOR 600 VSAT Ka is the smallest, lightest and most advanced 3-axis stabilised Ka-band antenna system for the Europe only THOR 7 High Throughput Satellite (HTS) satellite network from Telenor Satellite Broadcasting (TSBc). Based on a unique, cutting-edge composite/aluminium design to keep weight down and sophisticated SAILOR VSAT technology for unmatched performance and features, SAILOR 600 VSAT Ka streamlines the deployment process and maximises operational uptime. SAILOR 600 VSAT Ka is built to withstand the toughest sea conditions and still deliver high bandwidth connectivity on THOR 7. It is the fastest tracking antenna available in its size class, with superior dynamic performance in all axes; roll, pitch and yaw. This high performance means that smaller vessels more affected by rough seas can make the most of THOR 7 services, as SAILOR 600 VSAT Ka can maintain a strong link in extreme conditions (like those found in the North Sea), even on the edges of the beams. SAILOR 600 VSAT Ka simplifies the once complex process of VSAT antenna procurement and installation. This saves time and money. 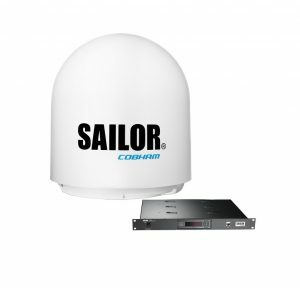 Cobham SATCOM has achieved this revolution not through a single design breakthrough, but with a wealth of features and design details unique to the SAILOR VSAT technology platform. For instance, a single cable between antenna and below deck equipment for RF, power and data combined with Automatic Azimuth Calibration and Automatic Cable Calibration enable unique ‘one touch commissioning’. The Dynamic Motor Brakes inside the antenna remove the requirement for mechanical brake straps and make sure the antenna is kept in balance in any no-power situation, at sea or during transport. Integrating SAILOR 600 VSAT Ka with the iDirect X7 Satellite Router is the smartest, most cost-effective way to access ground-breaking new high throughput satellite (HTS) services on THOR 7. Higher speeds, more reliability and class-leading installation time and cost savings, means this combination of state-of-the-art hardware and next generation services offers the ultimate support for business applications, vessel operations and crew welfare. Just like all other SAILOR VSAT systems, the SAILOR 600 VSAT Ka is incredibly easy to manage; ensuring service providers can offer the best possible support to customers anywhere in the world. Easy remote access and diagnostic features include monthly statistics logging, SNMP and built-in e-mail clients that automatically email historical logging of system performance. SAILOR 900 VSAT Ka is an advanced 3-axis stabilized Ka-band antenna system designed for the Telenor THOR 7 satellite network. The SAILOR 900 VSAT Ka is built to the same high quality and high performance that has made SAILOR the leading name in professional maritime communication equipment over decades. SAILOR 900 VSAT Ka is a direct development from the successful SAILOR 900 VSAT antenna system, which has created a new industry standard through innovative design for ease-of-use, quick deployment and reliable operation. SAILOR 900 VSAT Ka is built to withstand the toughest sea conditions and is probably the fastest tracking antenna with its superior dynamic performance in all axes; roll, pitch and yaw. Combined with tracking performance it is feasible to install the antenna even on smaller vessels which are more affected by rougher sea. unique features makes it possible to do a ‘one touch commissioning’ without the need for line-up or CPi, making SAILOR 900 Ka incredibly easy to deploy. With SAILOR 900 VSAT Ka and the iDirect X7 Satellite Router you have access to the Telenor THOR 7 high throughput satellite services so you can enjoy the power of broadband for business applications, vessel operations and crew welfare. SAILOR 900 VSAT Ka offers a number of features for remote access and remote diagnostic including monthly statistics logging, SNMP traps, Syslog functionality and built-in e-mail clients that automatically can email historical logging of system performance. These remote maintenance features gives the opportunity to offer the best possible support to your customers. SAILOR 900 VSAT Ka is designed and tested to the highest maritime shock and vibration requirements, IEC EN 60721 to ensure reliable service and prolonged life at sea. Moving operational efficiency to the next level with Inmarsat Fleet Xpress and SAILOR equipment. Fleet Xpress, Inmarsat’s new hybrid Ka-band/L-band service, will redefine what’s possible in maritime communications – offering consistent communications from a single operator. 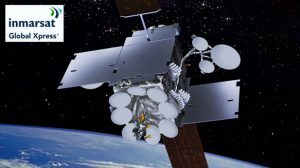 The high throughput GX satellites operate on Ka-band, the high redundancy and mature FleetBroadband satellites operate on L-band. The SAILOR user terminals have been the de-facto standard for maritime Inmarsat services for decades. 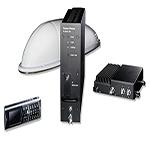 In order to obtain the complete Fleet Xpress service you need one SAILOR GX, one SAILOR FleetBroadband user terminal, a network service device and system integration from your service provider. 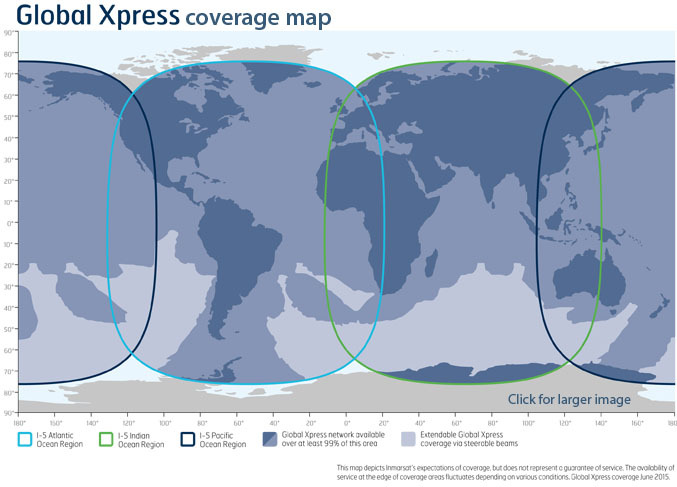 The three Global Xpress satellites have been launched into orbit between 2013 and 2015 and commercial services for Fleet Xpress are available from Inmarsat. 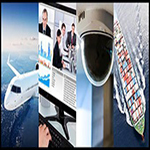 Offering consistent communications from a single operator, Fleet Xpress will make video conferencing a viable proposition for remote assistance and diagnostics, and enable advanced applications such as telemedicine and video surveillance that take your operational efficiency to the next level. Your crew are kept happy with regular video calls back home, the possibility to watch sport and the news, shop online and use social media – via their smartphones, tablets and laptops. Besides more bandwidth, Fleet Xpress gives you exclusive access to specialist maritime applications and content. Download the latest chart updates, integrate engine monitoring and transfer high resolution data for weather-routing applications, all from a centralised source. 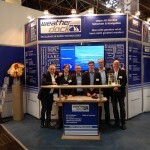 And distribute real-time information to all the vessels in your fleet simultaneously. Fleet Xpress is setting a new standard in maritime communications from Inmarsat, a trusted supplier that’s been serving the maritime community for over 35 years. Combined with Cobham SATCOM’s top quality SAILOR equipment and our worldwide service and support this becomes the most compelling solution for your vessels. The SAILOR equipment for Inmarsat Fleet Xpress is simpler and quicker to install than other systems, minimising any downtime in the dock for your vessels and saving cost and time. There’s the option of a smaller SAILOR 60 GX that doesn’t require a crane for installation, and the set-up for all terminals is just as simple as it is today for SAILOR FleetBroadband. The global, all-IP Inmarsat network will enable point-and-click capability with a consistent user experience worldwide. The SAILOR GX terminals for the Fleet Xpress service are quicker to install and easier to operate than others, and services will be available for a fixed monthly fee so you can easily manage your budget. Global Xpress operates in the Ka-band, which is already more efficient in its use of bandwidth, but because Inmarsat use their own satellites and ground network and manage the entire global network themselves. 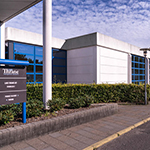 Inmarsat can make more effective use of satellite resources to achieve significant cost savings. Combined with the resilience of the FleetBroadband L-band network, which delivers 99.9 per cent overall network availability, the net result is more affordable, more reliable high-speed broadband. SAILOR 100 GX is an advanced 3-axis stabilized Ka-band antenna system designed for the Inmarsat Global Xpress® satellite network. As with all SAILOR VSAT antenna systems, SAILOR 100 GX is light and compact. 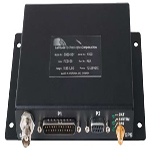 It uses a single cable between antenna and below deck equipment for RF, power and data, while advanced features such as Automatic Azimuth Calibration (home flag) and Automatic Cable Calibration significantly reduce installation time further. The unique Global Xpress One Touch Commissioning feature completes the package, making SAILOR 100 GX incredibly easy to deploy. SAILOR 100 GX features advanced Tracking Receiver technology that enables it to verify the right satellite in less than a second. This unique feature, tried and tested in the benchmark SAILOR FleetBroadband systems, ensures quick satellite acquisition at start-up and re-acquisition of the satellite in case of temporary blockage, after bad weather or poor signal strength. With SAILOR 100 GX you have reliable access to the full range of Inmarsat Global Xpress global high throughput satellite services so you can enjoy the power of broadband for business applications, vessel operations and crew welfare. 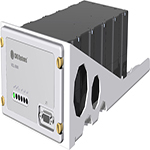 SAILOR 100 GX ships with the original SAILOR GX Modem Unit (GMU), which works directly with SAILOR 500/250 FleetBroadband to form the cornerstone of the Inmarsat Fleet Xpress service. The system is designed and tested to the highest maritime shock and vibration requirements, IEC EN 60721 to ensure reliable service and the longest possible life at sea. 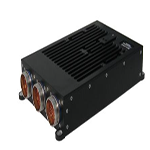 SAILOR 60 GX is built to withstand the toughest sea conditions and still deliver high bandwidth connectivity on Fleet Xpress. It is the fastest tracking antenna available in the 60cm class, with superior dynamic performance in all axes; roll, pitch and yaw. This high performance means that even smaller vessels more affected by rough seas can make the most of maritime broadband on Fleet Xpress, as SAILOR 60 GX can maintain a strong link even in extreme conditions and on the edges of the beams. Together, SAILOR 60 GX on Fleet Xpress with integrated SAILOR FleetBroadband, provide a step-change in vessel and fleet operation by enabling access to a new wave of IT applications that support operational efficiency and reliability in addition to crew welfare. Fleet Xpress delivers high bandwidth connectivity, while SAILOR 60 GX ensures that it is always available on board so vessels can operate smarter through harnessing the power of connected maritime IT and technology. SAILOR 60 GX is delivered ready to install, with the included SAILOR GX Modem Unit (GMU) and SAILOR Antenna Control Unit (ACU) ensuring quality and reliability throughout the system. Installation is easy, thanks to a wealth of features and design details unique to the SAILOR VSAT technology platform. For instance, it uses a single cable between antenna and below deck equipment for RF, power and data, while Automatic Azimuth Calibration and Automatic Cable Calibration enable unique ‘one touch commissioning’. It also features Dynamic Motor Brakes inside the antenna, removing the requirement for mechanical brake straps whilst ensuring the antenna is kept in balance in no-power situations, at sea or during transport. Just like all SAILOR VSAT systems, the SAILOR 60 GX is incredibly easy to manage; ensuring the best possible support is available anywhere in the world. Easy remote access and diagnostic features include monthly statistics logging, SNMP and built-in e-mail clients that automatically email historical logging of system performance. * In March 2016, SAILOR 60 GX won the prestigious Mobile Satellite Users Association’s (MSUA) 2016 Top Maritime Mobility Satcom Innovation award, highlighting it as one of the most innovative maritime VSAT systems ever developed.